***NEW*** Brioche Sandwich Buns. Made with our freshly ground flour & organic white flour, these buns have the classic Brioche (made with butter, eggs & milk) taste in a fluffy bun... perfect for hamburgers, BBQ sandwiches, meat sandwiches... or even with bread and butter served up with hot soup! CINNAMON SWIRL!!! Brown sugar, butter & cinnamon rolled into a whole grain loaf. Delicious as French Toast... or just cut a slice and let it melt in your mouth! 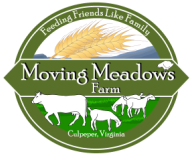 Other bakery items available: Made with the freshest, healthiest ingredients we can find... in keeping with our tagline, "Feeding Friends Like Family." 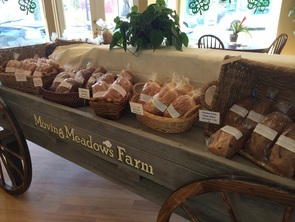 All baked goods made with our own Moving Meadows Farm fresh eggs. Original Homemade Cinnamon Buns - made with our fresh organic whole wheat flour and topped with our own original homemade maple cream icing! Yummy goodness! The first Saturday of every month...Cranberry Orange Cinnamon Buns﻿﻿ available. They are made with dried cranberries inside (instead of raisins), and a maple orange creamsickle icing. YUM!